This guide can help you decide if a residential scale wind turbine is right for you. Is Wind Right for you? Wind turbines are an effective source of renewable energy in many areas across the world. The American Wind Energy Association (AWEA) estimates there are as many as 13 million homes in the United States with a viable wind resource. You have at least 6.0 MPH (2.7 m/s) average wind speed for the Polaris 50, 100, 500 and 1000kW turbines. Best results at 12 MPH (5.4 m/s) or more. The ideal location for a wind turbine is 20’ (6.1m) above any surrounding object (trees, roof tops, hills, tall buildings) within a 250 foot (76.2m) radius. This generally means your property should be at least ½ acre (2,023m2)larger in size. Once you have determined you have the right conditions for a wind system, you will need to consider the best place on your property.Proper siting is critical to the performance and longevity of your investment. It can make the difference between years of trouble free operation or continuous frustration. This guide is a precursor to investing in a small residential scale wind turbine. Whether your reason for investing is because of your concern for the environment, helping reduce foreign fuel imports or pure economics, we at Polaris America want to make sure you get the most from your wind turbine. Before making any investment in small wind, be sure to review this guide carefully, ask lots of questions and once you feel confident, call your dealer. “Do I have enough wind?” is often the first and most asked question. Generally, if you feel like you have a very windy site, you most likely have a good place for a wind system. It is always a good idea to do your homework just to make sure. Wind resources can vary from placed to place. There are several places you can go to assist you. The U.S. Department of Energy recently developed a series of high resolution wind maps for much of the United States that will give you a good idea what your wind resource is at your location. Keep in mind, these maps are about 80 percent accurate and estimate the wind resource at about 150 feet (46 m) off the ground. Winds decrease the closer they are to the ground. You want to make sure the location of your property on the map is in a Class III wind or better. These maps have a resolution of +/- 1 km (0.7 mile). Click here for our wind maps page. You may also obtain wind data from your local weather station, university or even television station. You may also contact the closest weather, TV or radio station and ask them for an idea of the average wind in your area. Some local station web sites may have this information. Wind patterns can change over short distances, so try to obtain information as close to your potential wind turbine as possible. Airport data is not recommended. Airports are generally located in lower wind areas (valleys) and their measurement techniques do not produce good data. If wind maps or local data doesn’t work, another method is looking around and observing of the deformation of vegetation and trees on and around your property. The Griggs-Puttnam Index was a scientific study that looked at how wind deformed vegetation to determine the wind resource at a particular site. Compare the drawing below with your own property to determine your wind resource. 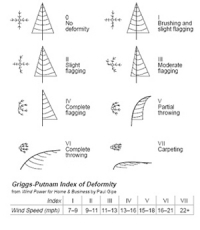 The Griggs-Putnam Index of Deformity is an additional useful tool to help determine the potential of a wind site. The idea is to observe the area’s vegetation. A trees shape, especially conifers or evergreens, in often influenced by winds. Strong winds can permanently deform the trees. This dormity in trees is known as “flagging.” Flagging is usually more pronounced for single, isolated trees with some height. The Griggs-Putnam diagram, like the Wind Resource Maps, can offer a rough estimate of the wind in your area. The more information that you can obtain from the various sources listed above, the greater degree of accuracy you will have in determining your wind speed and your potential power output. The last resource is conducting an actual wind resource assessment. This is by far the most accurate way of doing a site assessment but it is also the most expensive and time consuming. It involves the installation of a small tower on your property with 1-2 anemometers and a data collecting logger. Companies offer such hardware and then charge a monthly fee for consolidating the data and generating a report. Keep in mind that many Polaris America turbine dealers also perform site assessments. What is the “best” site? Wind resource is not the only consideration when siting. Components such as taller towers and running large amounts of wire–more than 500 feet (152 m) from your site–can add significant costs to your wind system. You will need to balance energy achieved in the best wind site over the cost of installation to determine the best overall placement of your system. Winds may be very turbulent running off a cliff causing wind shears. It is important to site the generator far enough from the cliff to avoid turbulent wind. Wind compresses as it blows over the top of a hill, increasing the wind speed. With proper placement, you may be able to use a shorter tower. We never recommend anything shorter than 33 feet (10 m). It is important to follow the general rule; that is the tower must be at least 20 feet (6 m) above any surrounding object. Very strong prevailing winds typically blow from the ocean. If this is the case, it is very important to install your wind generator as close to the coastline as possible. Trees and taller structures can be down-wind from the wind generator. A wind turbine must have a clear shot at the wind to perform efficiently. Turbulence which both reduces performance and “works” the turbine harder than smooth air is highest close to the ground and diminishes with height. Also, wind speed increases with height above the ground. As a general rule of thumb, you should install a wind turbine on a tower such that it is at least 20 ft above any obstacles within 250 ft. Smaller turbines typically go on shorter towers than larger turbines. A 1 kW turbine is often, for example, installed on a 30-50 ft tower, while a 10 kW turbine will usually need a tower of 60-100 ft. We do not recommend mounting wind turbines to small buildings that people live in because of the inherent problems of turbulence, noise, and vibration. The least expensive tower type is the guyed-lattice tower, such as those commonly used for ham radio antennas or cell phone towers. Smaller guyed towers are sometimes constructed with tubular sections or pipe. Self-supporting towers, either lattice or tubular in construction, take up less room and are more attractive but they are also more expensive. Telephone poles can be used for smaller wind turbines. Towers, particularly guyed towers, can be hinged at their base and suitably equipped to allow them to be tilted up or down using a winch or vehicle. This allows all work to be done at ground level. Some towers and turbines can be easily erected by the purchaser, while others are best left to trained professionals. Anti-fall devices, consisting of a wire with a latching runner, are available and are highly recommended for any tower that will be climbed. Aluminum towers should be avoided because they are prone to developing cracks. Towers are usually offered by wind turbine manufacturers and purchasing one from them is the best way to ensure proper compatibility. Small wind turbines do make some noise, but not enough to be found objectionable by most people. A typical residential wind system makes less noise than the average washing machine. Small wind turbines do not interfere with TV reception. Most residential-sized wind generators are direct-drive devices with few moving parts. Unlike the utility-scale turbines used in wind farms, they do not have high-speed transmissions. Thus, most of the sound that comes from a residential sized wind turbine is aerodynamic noise caused by the blades passing through the air. The noise level of most modern residential turbines measures close to the ambient noise levels under average wind conditions. It is audible, if you are out of doors and listening for it, but no noisier than your average refrigerator. How reliable is the structure? The U.S. has about 15-MW of nameplate capacity of small wind turbines – over 2,000 installations – with an excellent track record for safety. Following manufacturer specifications for the installation will ensure that the footings are adequate to anchor the structure. A building permit is also required, and the structure must meet local building and safety requirements. In the event of a power outage, small wind systems connected to the utility grid are designed to detect the outage and automatically shut down, so that there is no danger to anyone trying to repair utility lines. Stand-alone systems are connected only to the home’s electrical service, posing no risk to anyone trying to repair utility lines in the event of a power outage. Unlike tree branches, wind turbine blades are designed to withstand a heavy load of ice. And when ice builds up on the blades, they simply don’t “fly” any more – they loose their aerodynamic properties. In fact, an ice-covered rotor will turn so slowly (at only several revolutions per minute) that there is no danger of ice being “thrown” off. Typically, the ice melts and falls – straight down – to the base of the tower. Can people get hurt climbing the tower? Windmill towers pose no more of an “attractive nuisance” than any other climbable pole or tower in the neighborhood, including water towers, cell phone towers, etc. Some wind turbine tower designs have no available hand- or footholds so they simply can’t be climbed. Towers which need to be climbed for repair work can be equipped with devices to prevent falls, and some towers are designed to be lowered so that any maintenance or repair work can be done on the ground. Do small turbines interfere with electronic devices? Modern windmill blades are made of wood, fiberglass, or other composite materials which do not interfere with electronic devices. Do small wind turbines need to be lit? The FAA doesn’t require lights on structures less than 200 feet tall, and prohibits both commercial and small private aircraft pilots from flying lower than 1,000 feet. Pilots cannot drop lower than 500 feet when approaching a runway. The only time a small wind turbine would be affected by FAA regulations is if it were proposed to be sited adjacent to an airport. Many common structures that are taller than small wind turbines – transmission line poles, for example – are not required to be lit. However, turbine owners may need to alert crop duster pilots to their installations in certain regions. A general rule of thumb is to install a small wind turbine on a tower with the bottom of the rotor blades at least 20 feet (6 m) above any obstacle that is within 250 feet (76 m) of the tower, 25 feet (7.6 m) to the hub. Mounting wind turbines on top of homes is not recommended. Larger residential home wind turbines vibrate and transmit noise to the structure on which they are mounted. This vibration can lead to noise and structural problems with the building. Mounting on the rooftop can also expose the generator to excessive turbulence that shortens its life.